Adam Lewis and Liam Millar were sighted in senior training on Christmas Eve as Liverpool continued their preparations for Wednesday’s Premier League clash with Newcastle. 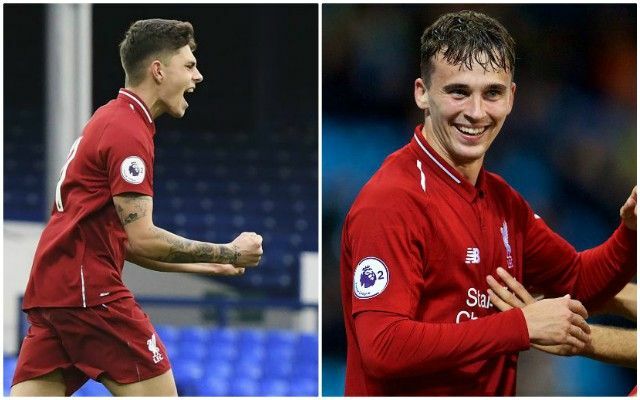 Their involvement continues a trend of U23s youngsters being rewarded with valuable opportunities to work alongside Jurgen Klopp’s table-topping Reds this season. Lewis, in particular, is an intriguing inclusion having emerged as a leading contender within the club’s youth ranks to make the transition into the first team setup. The left-back has been identified as a potential long-term replacement for Alberto Moreno, who is expected to leave the club in 2019, and a future heir to Andrew Robertson. Millar has meanwhile become one of the club’s most experienced youngsters, earning a full-time promotion from the U18s at the beginning of the season and having already registered four caps for the Canadian national team. Lewis has established himself as a prominent figure under Neil Critchley this campaign, starting each of the U23s’ opening 11 Premier League 2 games. The Englishman has also played from the off in all six of the U19s’ UEFA Youth League fixtures, captaining the side on five occasions. Such has been Millar’s bright impression on Merseyside that he has already reportedly attracted interest from various clubs across Europe, including a number of Championship sides, as well as from the MLS. The 19-year-old signed his first professional contract at the club in 2016, but could become a free agent upon the expiry of his current deal at the end of the season. Jurgen Klopp’s faith in both follows on from his call-up of highly-rated 16-year-old defender Ki-Jana Hoever, who signed for the club in September.